Good news teachers! Our Adaptive Placement Test feature has gotten a major facelift with several new capabilities and improvements. Welcome to our new placement test report which shows you all the important insights about how students performed in the placement test down to the exact number of questions in each concept tested. In this new release, we’ve also added new capabilities such as auto-assignment of placement tests and ability to assign placement tests in any grade level right from within the placement test page. Our adaptive placement test generates a real-time report showing you a breakdown of how a student performed on each concept within each unit – always available for you – not just after a student is done with the placement test but even while a student is currently working on the placement test. 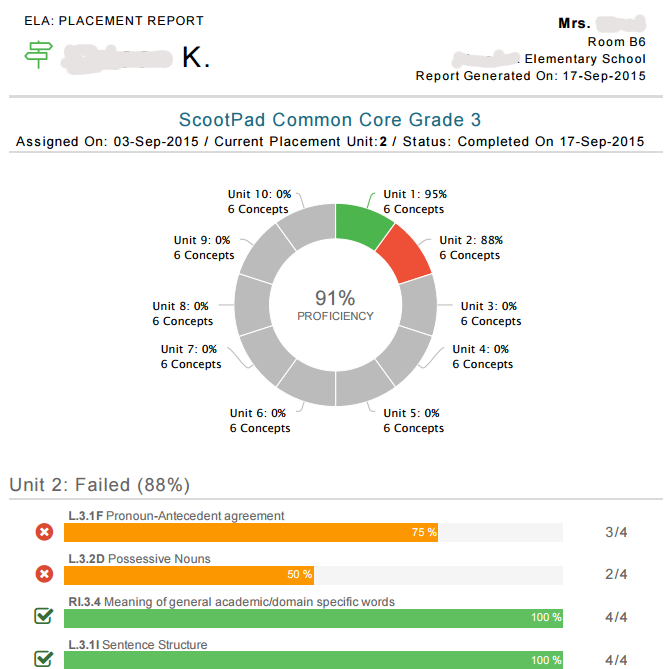 Pie chart at the top summarizes the results showing you an overall proficiency coupled with color coded units with the number of concepts in each and indicating a pass or fail. Leave the placement test assignment to ScootPad! This new setting under Math and ELA allows you to have ScootPad automatically assign placement tests. Whenever you enroll a new student or change one’s learning path, ScootPad will automatically assign a placement test for that student so they can be placed in the appropriate unit on their learning path. Want to test your students on what they learnt last year? No Problem! Assign a placement test for the grade level you want, right from the placement test page with just 2-clicks! This will move students to that learning path and assigns a placement test for them to launch from their dashboard right away. You can use the Placement Test at any time during the school year to quickly re-assess how your students are doing and how far they really moved along on their learning path – you can even challenge them with a reward (example: who ever places in the highest unit gets a candy). Well, you get the idea :). Want to learn more about our Placement test feature and how to use it? Visit our Help Center to follow step-by-step instructions. Or, feel free to start a Live Chat with us, email us at support@scootpad.com, or give us a call at 1-800-994-0706.